The following questions are from Bay Ward residents asking about LRT Stage 2. Questions about LRT phase 2 and related projects of Byron Complete Street and the proposed SJAM park. Q1: When will the trench and cover between Dominion and New Orchard start and end? The Tunnel work between Dominion Station and New Orchard Station will start in March 2020 and will primarily be complete Oct 2022. It is a moving site so will progress through different areas as the work progresses – not all at one time. Q2: When will we know about the planned measures the contractor will take to ensure the Woodroffe will be kept open to traffic? The intersection of Woodroffe and Richmond must be maintained throughout construction. This will involve shifting the intersection to one side while the tunnel is excavated and then through the use of decking after the tunnel’s structure is in place. While traffic will be maintained in both directions there may be some load restrictions which could impact truck routes at times during the build. Q3: Will the SJAM park be implemented at the same time ( eg underpass at Cleary, Lights at Woodroofe and the Parkway) ? Much of the work will be concurrent with surface works following the construction of the tunnel. The underpass at Cleary will be built in coordination with the realignment of the Sr John A Macdonald Parkway. In addition, two signalized pedestrian crossings of the SJAM will be implemented: one north of Rochester Field, and another, northeast of Dominion Station. A new pedestrian underpass will also be constructed north of where Churchill Ave deadends. Q4: When will the Byron Complete Street between Cleary and New Orchard be started? 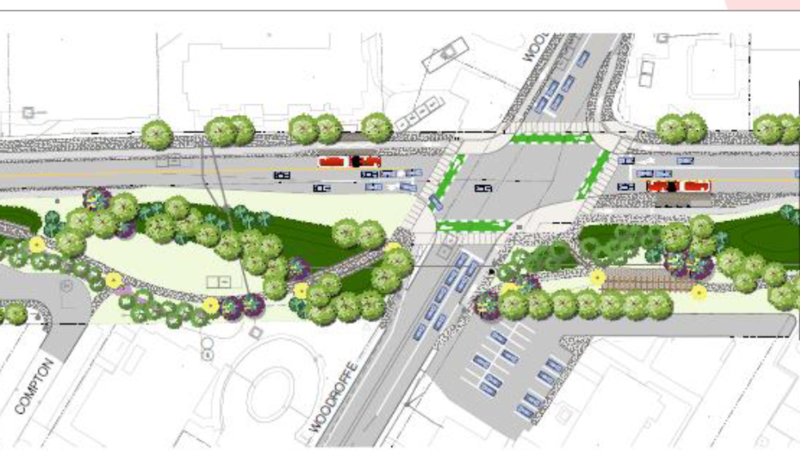 The work for the complete Street (presuming Richmond Road) will begin in Oct 2019 with some utility relocates and is expected to continue through the project until August 2023 but the activity will vary throughout. The work for Byron Park is concurrent with the tunnel work above in Q1. The 6 year time frame to the Western LRT Phase 2 seems excessive in comparison to the time it took to build the original Montreal subway which took only 4 years ( 1962 – 1966) and was all done all with cut and cover. There are a number of factors here that make it difficult to compare the Confederation Line Extension Project to a project that took place half a century ago. Building practices and standards have changed; environmental practices and standards have changed; the technology is different; permitting and approval processes are different; the Montreal Subway was a provincial project, this is a municipal project. etc. etc. Q5: Why does the LRT Stage 2 take so long to build? Given the complexity and scope (28km of LRT) of the Confederation Line Extension Project, six years is not unreasonable; bedsides, the City wants contractors to bid realistic schedules they can hold and this was the schedule the winning bid team set for themselves. Construction started for the first phase of Confederation Line six years ago in 2013, and that project is 12.5 km with less tunnelling than Stage 2 (although tunnel was bored, not cut and cover). Q6: Are there any incentives for the contractor to complete the work earlier? There are financial benefits within the structure of the contract for early completion as early completion would allow private sector investors to get their money back sooner, which increases potential profit for the contractor. Q7: Are there possibilities to break up the West part into 2 sections; ie complete the Moodie section 1st; to advance a partial completion of the Western phase earlier? No. The entire western extension (Tunney’s to both Moodie and Baseline) will open at the same time. We looked at segmenting to see if we could open from Lincoln Fields east earlier as part of the preliminary engineering, but this only resulted in potentially lengthening the time required to complete the entire project as well as making detouring and transfers more cumbersome during the build. Q8: What will the intersection of Woodroffe and Richmond look like? Below is an image showing the design of the intersection with many safety improvements, particularly from the cycling/pedestrian perspective. 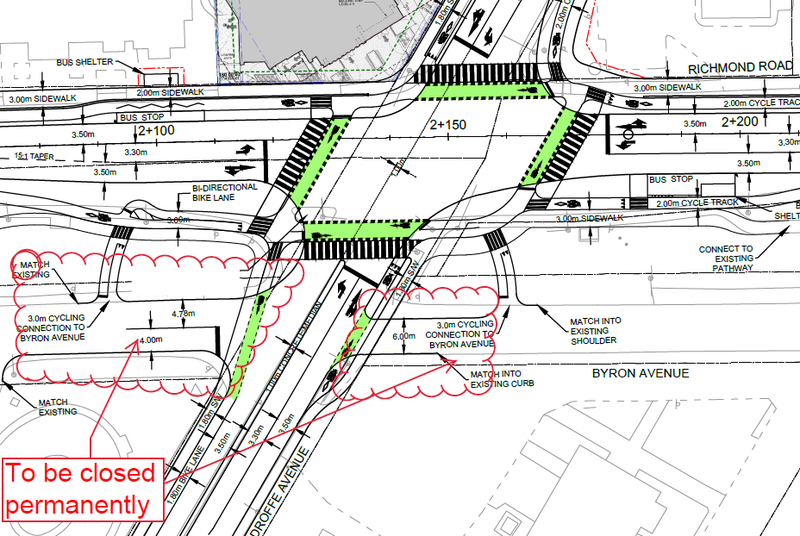 The city is also closing off the Byron Avenue access to/from Woodroffe on either side of Woodroffe (this also has the benefit of increasing the amount of green space available in the linear park). This is not depicted in the image, so comments have been added to clarify.